The 4 pack of reusable shopping bags is absolutely one of the best items I own for shopping with. The fact it is a neat little package, has a trolley token and has four good sized shopping bags is a must for not only the eco friendly shopper but the regular shopper too! No more paying for the better quality bags at the supermarket so that half your shopping doesn't end up sprawled across the car park when the usual carrier bags give out! I have been so thrilled with the footprint bags that I have recommended them to everyone! The price is amazing for the quality and there are even some bargains to be had on the website! "Footprint Bags are an ingenious product range created by two environmentally-aware young mums. When Hepden Bridge in Yorkshire, near where they lived, decided to become a plastic bag free town this sparked an idea, and 3 years later a fabulous and practical product – the reusable shopping bag pack. I still get excited at the anticipation that comes with expecting a parcel – especially a product for review. However, this time when the postman knocked with my parcel – a sleek and shiny black jiffy envelope – even my husband was intrigued. Inside the lovely packaging continued – wrapped in black tissue was my new 4 bag footprint bag pack. Smaller than I had anticipated, the pouch is secured with Velcro and contains 4 reusable bags – and the really clever part – a trolley coin attached to the handle so when you are shopping it hangs discreetly off the back of the trolley. The reason for getting the smaller of the 2 was I was thinking about ‘going in to town’ trip, or to keep in the glove box of the car so when I stop to pick up some essentials on the way home I always have bags. Normally dreading the supermarket I had a lighter than usual step as I set out to road test the bags. Firstly – massively less bulky to carry than the hessian/cotton/plastic bag for life ensemble I usually cart in with me – and just hang neatly off trolley or sit discreetly in corner. Then came the real test – would they hold enough? In fact they are a great size – larger than a carrier bag – but not so large you can’t then lift them up! The shape is great and very flexible, and the handles are wide and strong. Even the checkout commented on what a great idea and how neat they were. Carrying the bags from the car up the garden path revealed another advantage –the material the bags are made of means that the handles don’t cut into your flesh – even when heavily laden – result! One of the best and most practical products I have used this year – real thumbs up. I just need an 8 pack one now for the weekly shop – 4 just aren’t enough." "These are a really very good reusable alternative to plastic bags. They are made of tough parachute material with wide handles which are much easier on the hands than plastic bags. This means they are very strong, yet soft. They fold up very small and fit into a handy multi-pack. They come in 4 or 8 bags to a pack. We use them!" The Kitchen Critic website reviews many products and is well respected. Have a look at the article they wrote about the Footprint Bag product on Kitchen Critic. I've changed the recipe a bit after doing some further research on the web - using hot water rather than cold makes it easier to crush the tablets up and a spoonful of honey added to the final mixture is not only good for your skin but it helps it stick to your face a bit better, so you don't end up with flaky bits on your clothes. I received an exciting parcel this week when my new FootprintBag 4-pack arrived - they're these great eco alternatives to plastic bags that you take shopping with you. I already had the eight-pack of strong fabric shoppers; they fold up into a neat package that is easy to keep in the boot of the car and then take with you on a shopping trip. They also have a handle to hang off of the trolley and come complete with a trolley coin. There was only one flaw with the bags - the pack was great for the supermarket but too big to take out when you hit the high street for shopping. I did try keeping a small cotton shopper or plastic bag in my handbag but I only ever managed to use it once as I kept forgetting to put it back into my handbag once I'd emptied out everything I'd bought. Fortunately, the mums that designed the FootprintBag realised there was great demand for a smaller pack and so they've just launched the solution - a four pack of bags. It still has the trolley coin if you are going to do a small supermarket shop and the fact that it's so small and neat means it can go into a handbag or hang off a buggy. Inside are two of the regular tough and roomy shopping bags but there are also two stylish shoulder shopping bags as well! I think these are a great alternative to the plastic bags for life that I seemed to have a growing collection of. They were breeding in my cupboards of late so it's good that my collection will start to dwindle! I like pretty cotton shoppers but you can't really squish them up small enough to fit in your handbag - so this is definitely the answer. Brand design agency The Engine Room has created the look and feel for a new product that is reaching out to eco-savvy consumers. Footprint Bag provides a convenient alternative to using the endless supply of plastic bags used in supermarkets and other retail outlets. With more capacity than the single ‘bag for life’, Footprint Bag is designed to be hung on a shopping trolley and is packed with up to eight reusable shopping bags. Footprint Bag stemmed from the increasing trend for retailers to adopt plastic bag-free shopping. The brand identity created by The Engine Room references feet as a direct analogy to everyone's carbon footprint. The work also included on-pack design and supporting literature. The brief was to create a cool, funky look for the brand, yet one that would be attractive to both consumers and retailers alike. Creative director of The Engine Room, Darren Evans said: “Although this is an 'eco' brand, Footprint Bag is also an iconic statement and has been branded accordingly. By designing it as a lifestyle product, it opens up many more possibilities for brand extension and development“. Every time I write about another 'eco' bag I vow never to do so again. But they will keep bringing out new ones that are somehow crucially different from the last, in such ways that I can't help thinking someone would find useful, and that it might just persuade one more person to stop using plastic bags. So here we go with a new-fangled idea called the footprint bag. Follow the jump to find out what's special about it -- if your bag-fatigued mind can take it. It does have some rather fun features. Footprint bags are intended to be an antidote to the bulky, often scratchy bags for life that many supermarkets sell and that some people claim to find awkward to fit into their day-to-day lives (you can't easily fold one up and carry it around with you all day) and contains a number of smaller bags within one neat holdall that's designed to fit on to the back of a trolley. One feature I know I'd find useful is the 'trolley coin' that's permanently attached to the outer bag, so you'll never need to go in search of change when you want to do a big shop. I can see it being a success for that reason alone! But you'll certainly never need to say 'yes' to a plastic bag if you have this with you at the checkout. Sainsbury's have removed their bags from the packing areas at the checkouts, M&S are charging for their bags and other supermarkets are following suit to encourage us to supply our own and cut the number of bags that end up in landfill. I think it's a great idea but I'm struggling with the basic bit - remembering to take the bags out with me. It's enough trying not to forget my shopping list or what I've gone out for, let alone remembering to pack a cotton shopper or a bag for life! Twice last week I've had to juggle packets of biscuits, bananas and a French stick back to the car from the M&S petrol station in Long Lane/Uxbridge Road after refusing to buy another plastic bag (I only went in to pay for petrol so didn't take the bags from the glove box with me). I also forgot my cotton shoppers last week when I went to Uxbridge, so I did my shopping in various shops, refused plastic bags and just kept adding my purchases to the flimsy bag from the first shop. By the time I was almost home, the bottom was falling out of the bag thanks to all the '3 for 2' credit crunch offers in Boots! When I do remember to take bags with me to the supermarket, I either end up with too many or not enough. But at last I've found the solution and I'm pleased to say it's a very clever invention by a couple of mums. The innovative Footprint Bag is an extremely clever 'bag within a bag' system. It has eight black reusable and stylish bags made from super tough parachute material within one compact pack that can easily fit inside your handbag. Each bag folds up and fits neatly inside a little pouch and, best of all, there's a handy trolley coin attached too. A trolley coin is another great invention that I own but can never lay my hands on when I need it! At least this way everything you need is in one place. The Footprint Bag is so easy to use and I get envious glances every time I use them. The checkout staff and other shoppers always want to know where I got them from and I guarantee that one of the big supermarket chains will be snapping up this brilliant design very soon! They are only available on the internet at the moment and are priced £19.50, including free post and packing. Initially I thought this was quite a lot to pay but, as the checkout lady pointed out to me just today, that's less than £2 per bag and they are really worth it. She said she thought they were worth much more! I've only used my Footprint Bag three times but was so impressed I've already bought two more as presents for family. .
Now that the plastic bag is officially frowned on we are all left searching for alternatives. The demise of the carrier bag comes none too soon for me, and I was one of the first to invest in the heavy-duty reusable bags. Not only were the bags stronger, so no more embarrassing moments with my groceries spilling across the car park, they also made me feel good for a change about my weekly shop. I was doing “my bit“ so to speak. But I am increasingly frustrated at my own ineptitude at remembering firstly to put them in the boot of my car and, secondly, if I do remember them I completely forget their existence until I am halfway round the supermarket with a trolley full of shopping. At the checkout I am then left with a dilemma; buy more bulky bags; take my trolley full of shopping and put it into the bags back at my car, or go back to the dark side and use disposable ones. So I have been interested to see the growing number of companies introducing reusable shopping bags that shrink down to minuscule proportions and can be secreted into my handbag after use. The Footprint bag is a nifty eight-in-one bag which hangs over the back of your trolley. However, I was a perturbed to find it was made in China. A chat with a colleague and a closer inspection of her Envirosax bag yielded an equally unpleasant discovery on the label. It sat rather uneasily with both of us; we both wanted to do our bit to “save the planet“ but not at the expense of child labour in Far East sweatshops. We decided to take the matter further and what we discovered made the purchases more palatable. Envirosax's response was swift: “Our workers are well-paid and there are no children. Envirosax bags are made in China due to cost. Fair trade and fair wages is an issue in third world countries, but our manufacturer has met all fair trade guidelines.“ They did add that many eco-friendly bag companies say they practise fair trade, but further research reveals their products are often made by other companies. Further research reveals no mention of the environment, sustainability or anything green-related. A similar response was forthcoming from the FootprintBag people. “Ideally we would have loved to manufacture our bag pack in the UK. Naively, we thought that this might be possible, however there just isn't an industry here due to cost etc. We didn't choose China lightly. However we have found a very ethical factory who comply to strict standards.“ I have to applaud the speed of their responses, but they should get that message across to the consumer, who is just trying in their own small way to be environmentally-friendly. 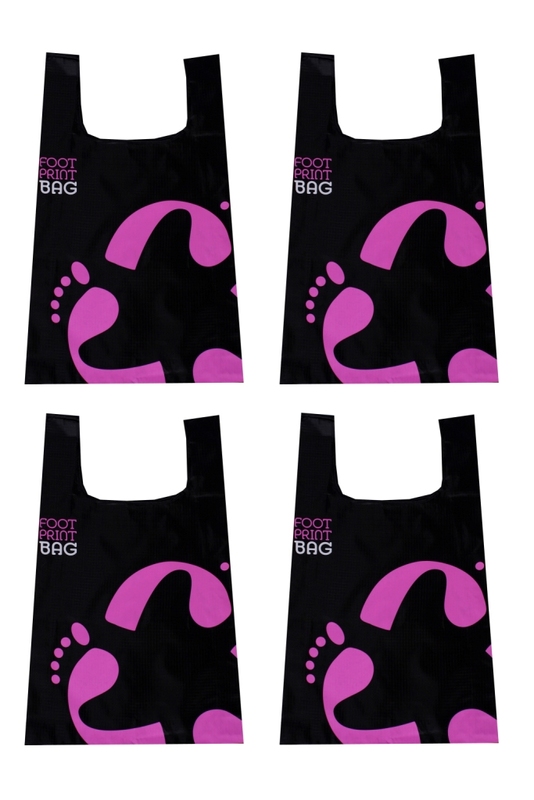 The FootprintBag has been designed as a compact alternative to the many reusable shopping bags available on the market. Containing eight reusable bags made from rip stop nylon – normally used for parachutes – within one compact pack, the FootprintBag is small enough to fit into a handbag and is designed to be hung on a supermarket trolley. Mums Claire Peto Cook and Hanny Wadsworth, from Huddersfield, formed their business last November, working through pregnancy and two births. They have since found a manufacturer and supplier for the bag and are currently in talks with supermarket chains to stock it. They say both Leeds-based Asda and Marks and Spencer have expressed an interest in the product. HEBDEN Bridge's plastic bag-free policy inspired two mums to launch their own new reusable shopping bags. The FootprintBag, a bag within a bag, is a hard-wearing and stylish alternative to many reusable shopping bags available on the market.. The compact pack can fit inside a handbag and can hang on a supermarket trolley. The Footprint Bag shopping bag pack is a one-off purchase that helps provide a solution to the environmental damage that plastic carrier bags cause. Retail giants Marks and Spencer and Asda have already expressed interest in the bag for which there is a manufacturer and supplier. The two secured the backing of former Dragon's Den star, and founder of Red Letter Days, Rachel Elnaugh, to help them get the product into the shops. The business was formed last November. The Engine Room have created the brand identity for what is being tipped to be the next green consumer revolution - Footprint Bag. Footprint Bag is 'the only true alternative' to the plastic carrier bag. Designed to be hung on a supermarket trolley and holding up to eight re-useable carriers. Footprint Bag is set to revolutionise people's shopping habits. The bags are made from rip stop nylon (the same as parachutes) and are neatly stored away in pouches. Every single plastic bag you have ever used in your lifetime hasn't biodegraded and broken down yet. It's a hot topic at the moment with many towns now opting to go 'plastic bag free'. Footprint Bag allows you to still use multiple bags again and again and again. The new identity references feet as a direct analogy to everyone's carbon footprint. We really believe that Footprint Bag can replace the need for using plastic bags in supermarkets and other retail establishments. The brief was to create a cool, funky look for the brand. “Although this is an 'eco-brand', Footprint Bag is also an iconic statement and has been branded accordingly“ said Engine Room Creative Director Darren Evans. “By designing the pack as a lifestyle product, it opens up many more possibilities for brand extension and development“. The FootprintBag, which can be fitted into a handbag, contains eight high-tech reusable bags within one compact pack. Companies such as Marks and Spencer have already shown an interest in buying the product. Also, former Dragon’s Den entrepreneur Rachel Elnaugh is mentoring the mothers in a bid to get the product in the shops. We’re just two mums who came up with this idea, did a lot of talking and then decided to go for it. Using plastic bags has become such a big issue and I often find them such a trial when you go shopping. We were already taking reusable bags for our weekly supermarket shop.However, we were frustrated by the lack of choice on the market and car boots full of various bulky reusable bags.When Hebden Bridge became a plastic bag-free town we took our inspiration from that and wondered what the solution could be. After quite a few design sessions, attempts on the sewing machine and trial and error we came up with the product we now have.I’ve had people stop me in the supermarket and ask where I got it from, so I think the demand is out there.